and the New 'Pubs Minister' Kris (who appears to block ALL pro pub campaigners from his twitter account) Hopkins. I'm sure my posting this accurate appraisal of this latest-not-enough-by-a-million-miles 'government support' for pubs will make it impossible for me, or any of my publican colleagues who are deeply concerned about the future of British pubs, to meet this man of pubs, publicans and the people and places they serve. This post will no doubt serve to discredit the campaigns I am associated with and confirm that the government is right to do nothing, as usual, for pubs because the ungrateful peasants are not getting down and prostrating themselves before The Minister for Maintaining the Status Quo. 'Package of support'? This is feeble, weak, pathetic 'support' (read 'crumbs') for, by Kris Hopkins' own admission, a significant part of the British economy. The language of the press release leaves little doubt that whoever was tasked to write it was struggling to believe the package is anything more than a bit of stale pie wrapped in a bog roll. "Community Pubs Minister Kris Hopkins has today (11 November 2014) announced £50,000 of extra funding for the Plunkett Foundation which runs a telephone support line for communities who fear their pub might be under threat." PATHETIC. Fifty thousand pounds? 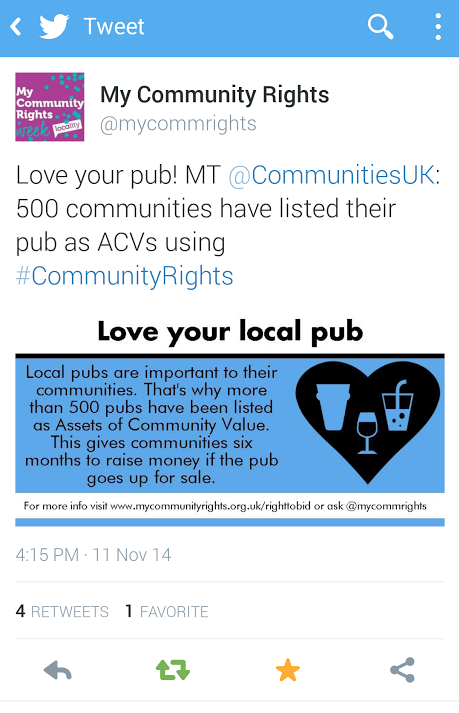 There are FIVE HUNDRED Asset of Community Value pubs already granted and hundreds more are on the way and Plunkett "runs a telephone support line for communities who fear their pub might be under threat." PATHETIC. Put this into a proper perspective: Just at a small level which I am sure most people have not heard of AT ALL about Marston's. 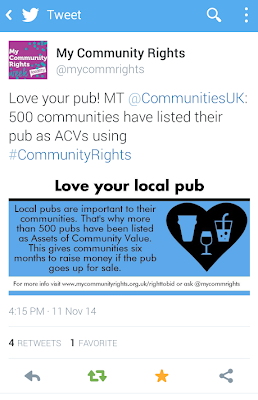 Do not forget that Marston's are amateurs when it comes to asset stripping their 'underperforming' pub estates. Ralph Findlay has been getting into Ted Tuppen's old strides recently but still pales to insignificance when you consider that ETI and Punch get rid of around 500-700 pubs a year for alternative use between them. One arm of the Cooperative movement is saving pubs while another is turning considerably (loads) more of them into supermarkets...than it manages to 'save' as pubs. Here's a report from April 2014 on the Co-operative Estates website about the New River Retail / Cooperative Love In. This is called Asset Stripping in most places, when it comes to pubs it doesn't even get a mention at government level. Mind you it's doubtful, given the amount of interest government has in pubs, as opposed to Chianti, they even know these things are happening. And from what I know of the Co-op they probably aren't aware in high places that they are pub killers. "In November 2013 NewRiver announced its £90 million acquisition of a portfolio of 202 public houses from Marston’s, with the primary intention of conversion of land and buildings to alternative use, notably convenience stores." There needs to be joined up POLICY and there is NONE. It is PATHETIC. Whatever happened to Nick Hurd when we need him? 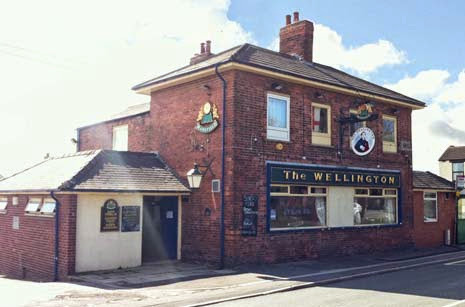 And just after I finished this post I found a petition asking Marston's not to let The Wellington Hotel, a pub in Chesterfield, Derbyshire, be force closed and converted to a Cooperative Local Store. If YOU care about what is happening as Britain gets buried in swathes of carbon copy pubs as almost two thousand potentially brilliant 'independent' 'sole trader' pubs are flogged off by flybynight scammers then follow the Wellington link and sign the petition. Then tweet and facebook it and ask all your friends to do the same. AND now the morning after. Another Marston's New River Retail Coop deal over The Ship Inn at Whitemans Green, Cuckfield THIS is their Twitter feed and THIS is their Facebook page and THIS is a video about it. Thanks for spotting and linking to the Welly petition. The more support we can get the better. The social campaign is also on fb https://www.facebook.com/saveourwelly and twitter @saveourwelly. Anything anyone can do to raise the profile will be appreciated.